Prime Minister Dr the Honourable Keith Rowley will travel to St Kitts and Nevis today (Monday 25 February, 2019) where he will attend the 30th Inter-sessional Meeting of the Conference of Heads of Government of the Caribbean Community (CARICOM). Senator the Honourable Dennis Moses, Minister of Foreign and CARICOM Affairs, will accompany the Prime Minister to the regional meeting which will run from February 26-27, 2019. The meeting will seek to, among other things, further advance action on the CARICOM Single Market and Economy (CSME) which was the focus of a Special Meeting of Heads in Trinidad and Tobago in December. 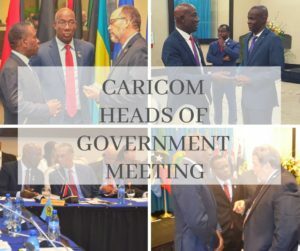 Heads of Government will also examine recommendations from a Special Meeting of the CARICOM Council for Trade and Economic Development (COTED) on Transportation. The Honourable Colm Imbert, Minister of Finance, will act as Prime Minister until Dr Rowley’s return on Thursday 28 February, 2019.